I am not one to instantly want to revisit a city, but this visit to Memphis was just a taste, both literally and metaphorically, of what this city has to offer. Like the slit in a long dress on a beautiful woman, Memphis gave me a glimpse and I want more. Memphis seduced me. There, I said it. We came to Memphis for the Bloghouse Conference, a travel blogger conference designed to give emerging travel blogs the tools to grow to the next level. 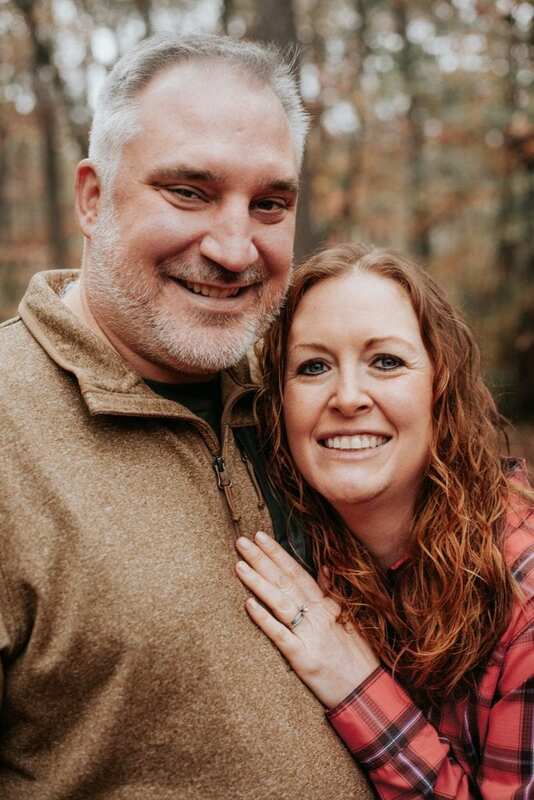 So, our days were full of organized activities and our previously scheduled road trip to Washington state did not allow for any extra time in Memphis. Thus, we did not get to explore as much as we wanted. Much of what we experienced of Memphis was food, which is exactly as it should be. Memphis is, after all, a pearl of the South and we express culture in the South through food. Memphis is no different. 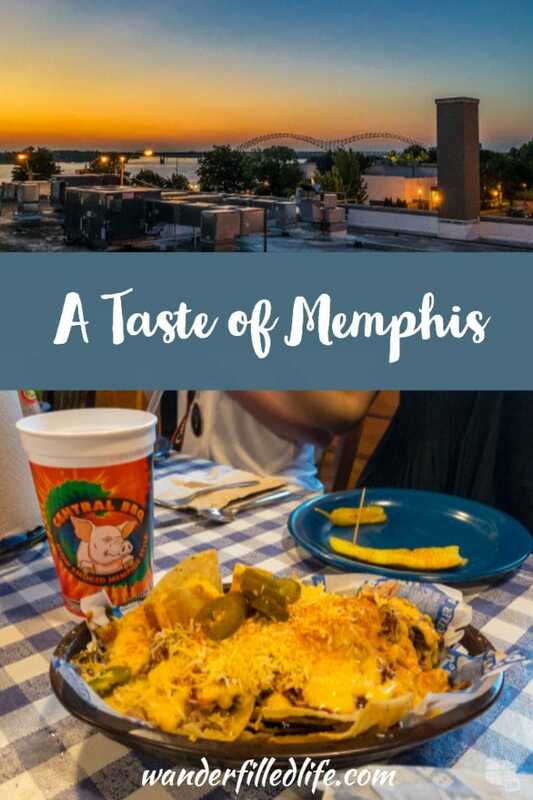 So, join us on a brief culinary exploration of Memphis. Our first eatery, Loflin Yard, is one of the most relaxing locations I have ever been to. 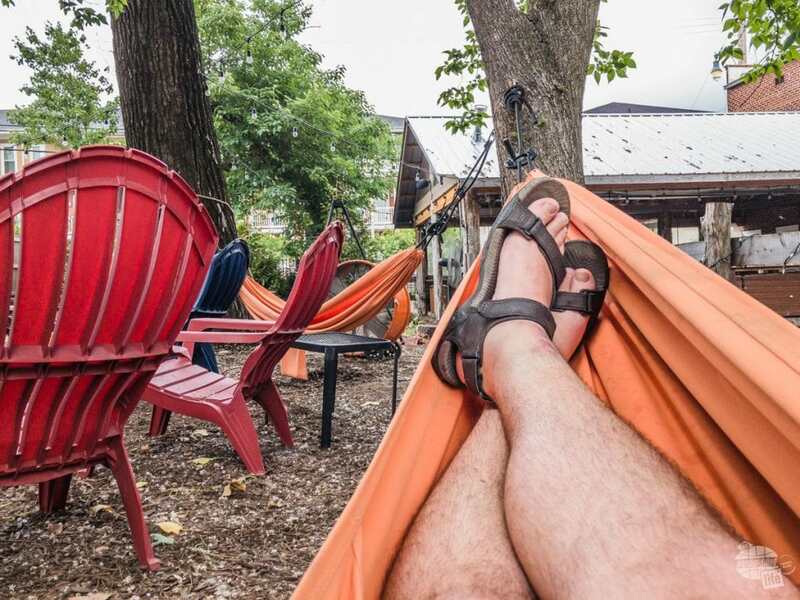 Located in an up and coming section of Memphis, this spot features tons of lawn chairs, hammocks and corn hole boards to facilitate a perfect afternoon relaxing with friends, including the four-legged variety. Grant found the perfect place to relax after a tasty lunch at Loflin Yard. The food is a perfect combination of classic Southern with a modern twist. The pimento cheese dip was traditional without a lot of sharpness and made for a great starter. The brisket tacos are a good balance of the smokiness of the brisket with the creaminess of the avocado. The veggies offer a healthier option with just the right amount of seasoning. The smoked wings were an unexpected treat; the smokiness is subtle and rich and is a delightful switch from the typical wing. 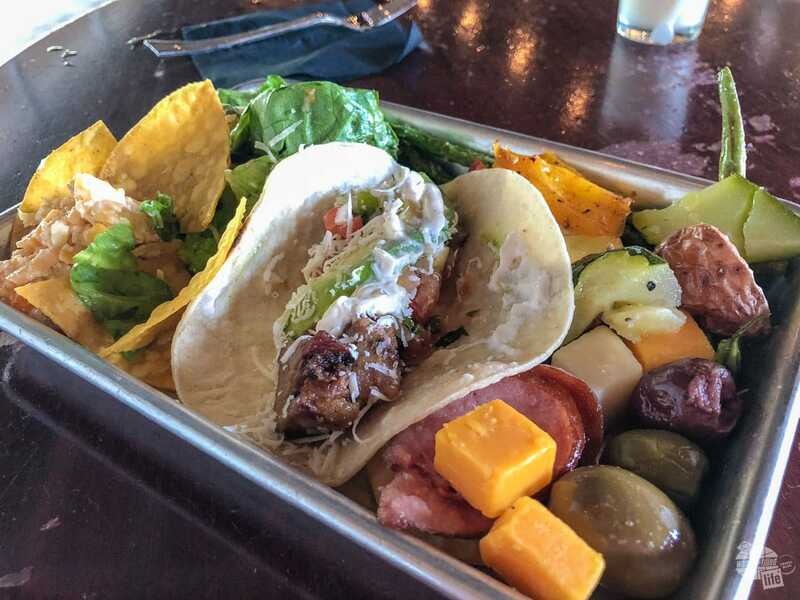 Meat, cheese, veggies, pimento cheese dip and a brisket taco made for an amazing meal at Loflin Yard. 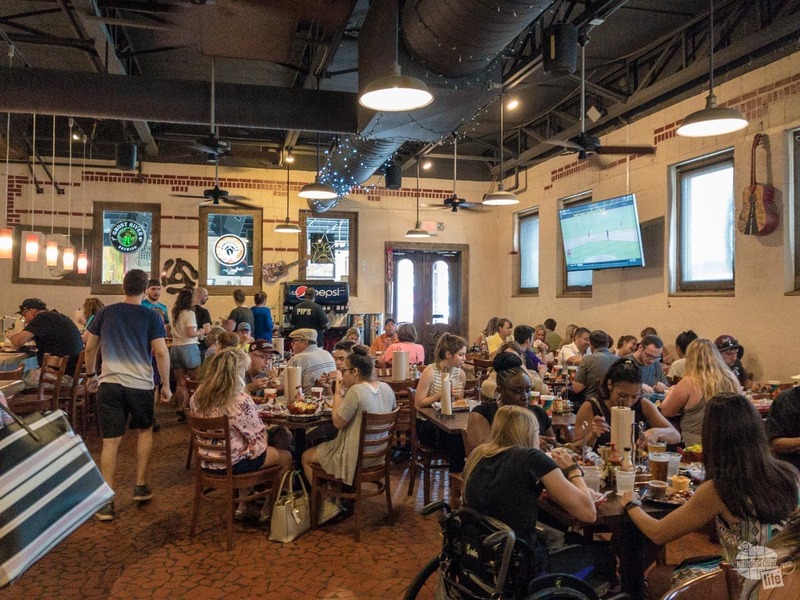 Loflin Yard is the ideal spot for a weekend lunch, especially after a night out. Just bring a desire to relax and enjoy good food and a refreshing beverage. We can’t wait to go back to try the barrel-aged cocktails. 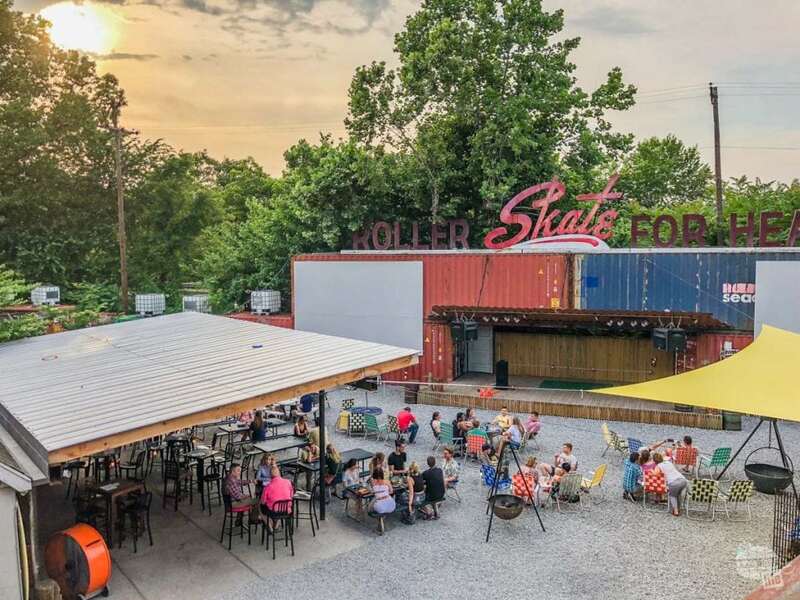 Railgarten, Loflin Yard’s sister location, offers a larger space (1.5 acres) with more games, live music, ice cream, not to mention some tasty food and local beer. 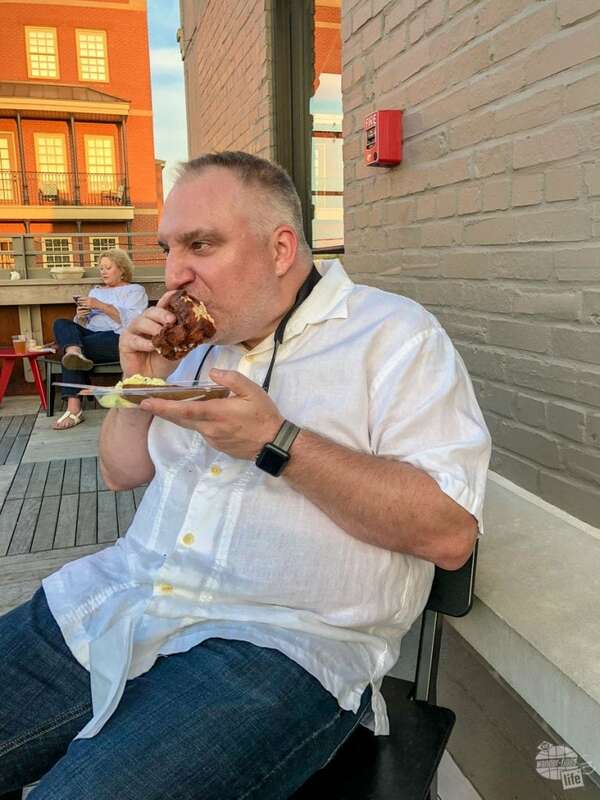 I am not typically a fan of veggie burgers… I love meat, but the veggie burgers at Railgarten were outstanding. The rooftop patio we had for our private party offered a nice view of the “playground” below and a bit of solitude. Like it’s sister property, Loflin Yard, Railgarten offers a really cool outdoor dining and recreational area. With plenty of games and lots of refreshing beverages, there’s a lot to enjoy here. Railgarten is located in the Cooper Young neighborhood, not far outside of downtown. Looking a relaxing place for a group of friends to hang out away from Beale Street? Railgarten is the spot. I had never been to a BBQ joint where they have doorman until I came to Memphis. Memphis takes BBQ seriously. 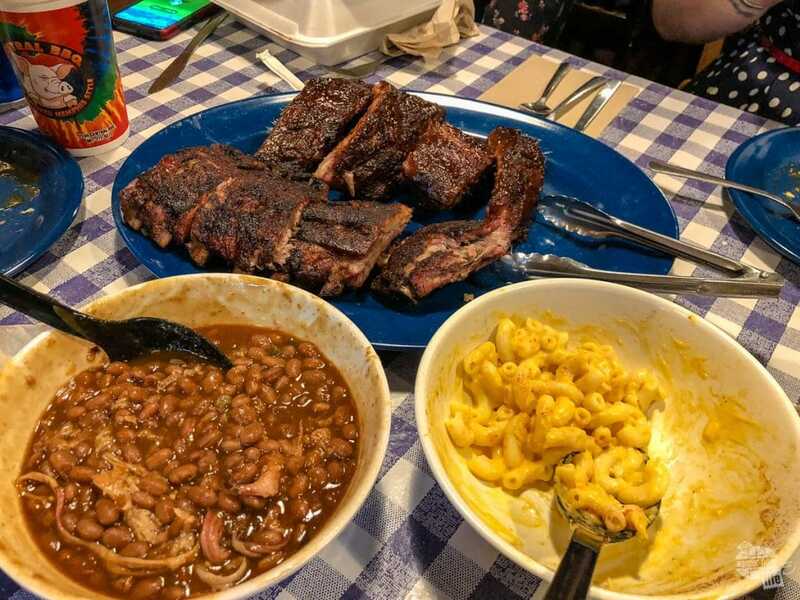 There are 117 BBQ restaurants in Memphis, all of which claim to have the best BBQ in town, but Central BBQ has been constantly named the best BBQ in the city for good reason. Central BBQ is one of the best BBQ joints in Memphis and you will often find a wait to get in. They brought a full court press of tremendous dishes. The BBQ nachos was the perfect twist on a classic dish, but once you get to the sides you know you have found a tremendous BBQ joint. Mac and cheese, baked beans, collard greens? All mouthwatering. That’s it, that’s it, that’s it right there. Then the main event… If there is one thing Memphis is known for it is ribs. Memphis-style dry rub ribs are easy to imitate but incredibly difficult to master. These ribs were done expertly. Just firm enough to stay on the bone, juicy but not dripping and just the right amount of seasoning to bring out the taste without overwhelming the meat. It is rare to find this level of perfection on a plate. Central BBQ has some amazing BBQ, not to mention the sides. You won’t find BBQ like this anywhere else but Memphis. 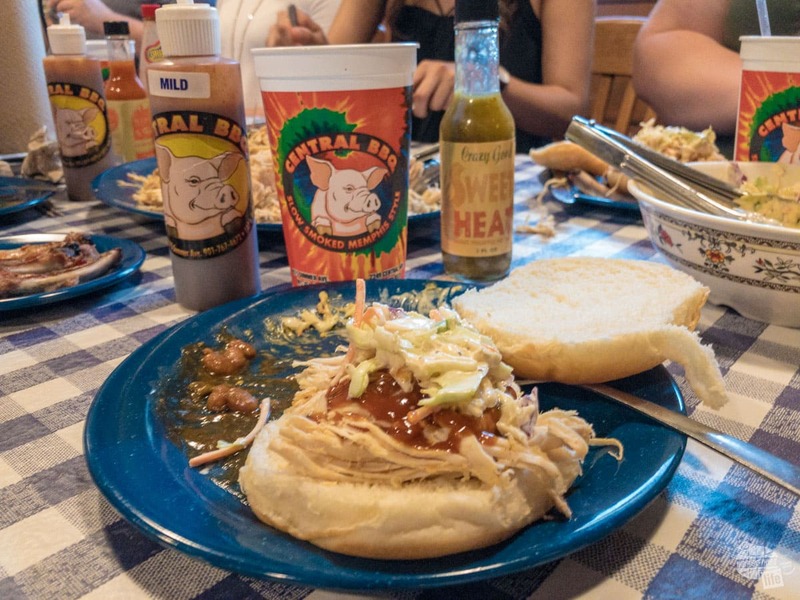 While the ribs are the main event of Memphis BBQ, don’t neglect the pulled chicken. Pile it high on a bun, toss some slaw on there, but most importantly, ask for some of the “Sweet Heat” wing sauce to top it off. It’s a damn good thing my mom was not with us. That said, this habanero-based pineapple sauce is not for the faint of heart, so try it first, before dousing your sandwich! I know there are plenty of other great BBQ joints in Memphis and we can’t wait to try more. Confession time… We did not actually go into Gus’s Fried Chicken. Instead, the lovely folks across the street at Old Dominick Distillery had some Gus’s Fried Chicken on hand for us to eat while we tasted some of their cocktails. I wish this was just hyperbole when I say it was some of the best fried chicken I have ever put in my mouth. The reason I say “wish” is Memphis is not exactly around the corner for me and I need to get some more. We ate like The King on this trip were never left feeling hungry, yet I went back for seconds on this chicken. It was that good. The sides were great, especially the mac and cheese (Bonnie’s favorite), but the chicken steals the show for me. You can expect us to hit Gus’s again the next time we are in Memphis. Grant chowing down on chicken from Gus’s. Old Dominick Distillery makes Memphis Toddy, a spiced whiskey, which is a perfect mixer for a whiskey cocktail or by itself. It is a little sweet for my tastes (which run to more smokey whiskeys and Scotch), but Bonnie loved it, so we got a bottle to add to our bar at home. 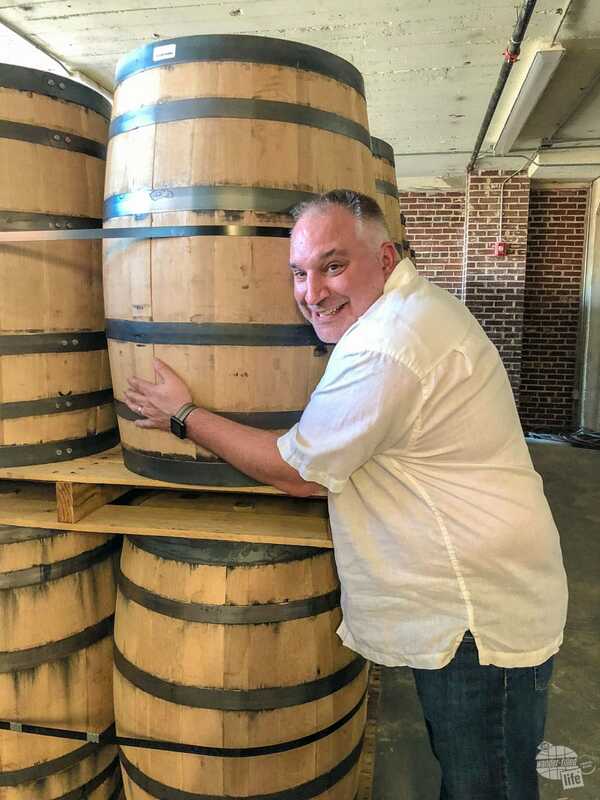 The distillery also makes various flavored vodkas and is working on a traditional Tennessee Whiskey, but it is still aging. Grant can’t wait for the whiskey to age! We took the tour through the distillery, which is a perfect introduction to the distillation process. 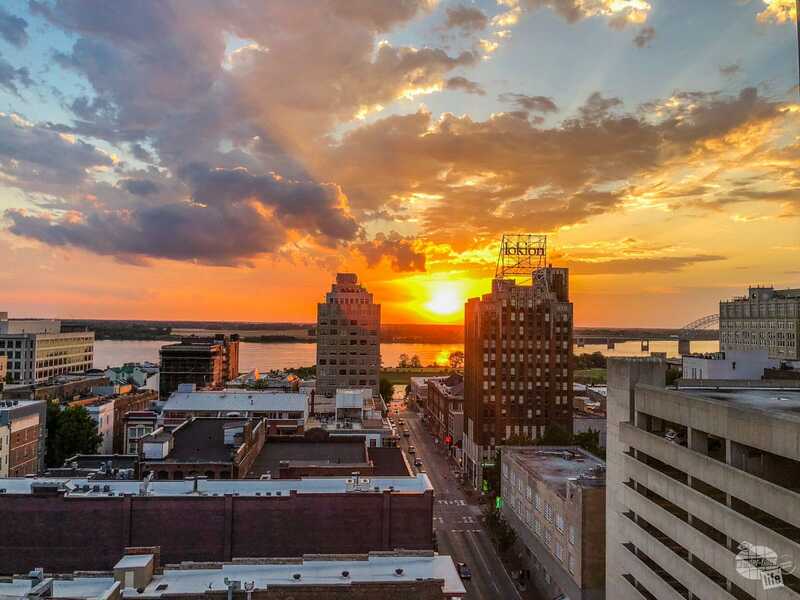 The distillery has a great cocktail bar downstairs and a rooftop bar with a great view of downtown Memphis, especially at sunset. Occasionally, they have live music up on the roof, which is a treat. Party on the roof at Old Dominick’s. 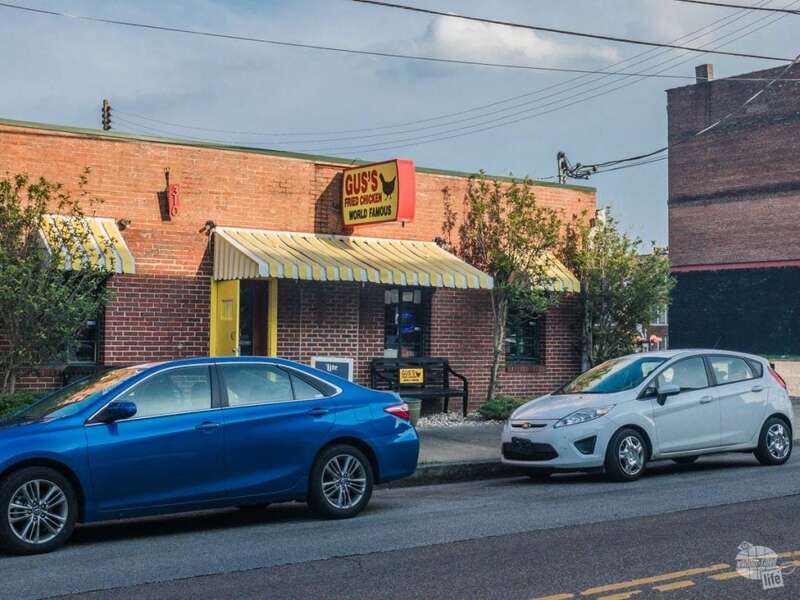 Paired with an early dinner at Gus’s, Old Dominick’s makes a great place for drinks and a sunset view before heading out to Beale Street for live music. We didn’t spend nearly enough time in Memphis and there so many things we feel we need to cover which we didn’t get a chance to do: the National Civil Rights Museum, the Sun Records studio, the Gibson Guitar Factory, the various music halls of fame, the Bass Pro Pyramid, kayaking on the Mississippi, taking a riverboat and spending time on Beale Street listening some live blues. That said, we did have some awesome experiences in Memphis, which gave us a brief taste of what the city has to offer. Love him or hate him, no trip to Memphis is complete without seeing Elvis Presley’s Graceland. No visit to Memphis is complete without touring Graceland. 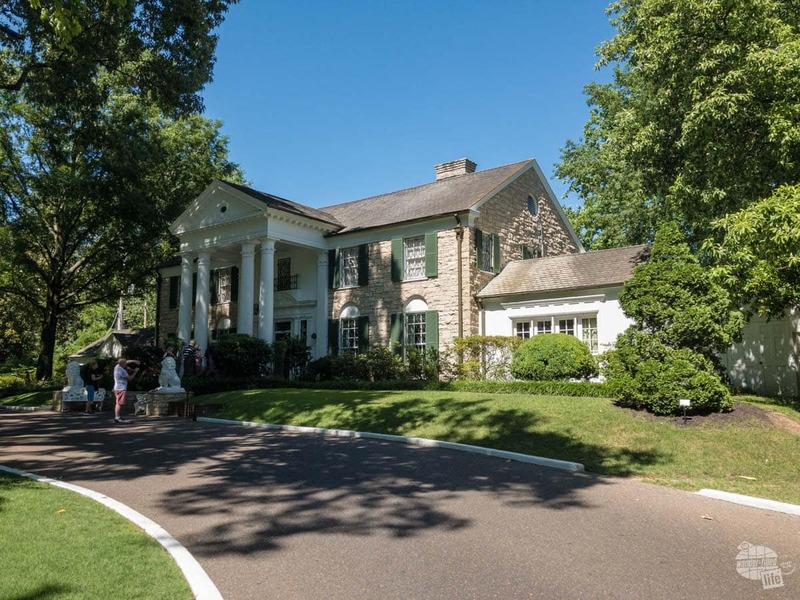 The iconic home of The King is every bit the opulent home you would expect. The home has everything from a den appropriately called the “Jungle Room” to a racquetball court. 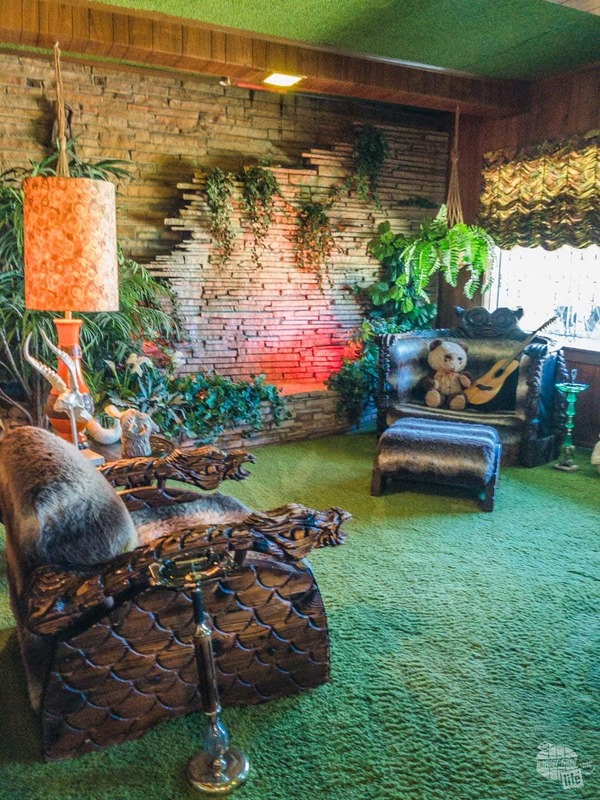 According to Graceland, the upstairs was very private to Elvis and, thus, is off limits out of respect. When touring Graceland, an iPad with an audio tour and multimedia clips is included. The clips provide a walking tour throughout the house and grounds, adding a lot of context to the tour. Once you are done touring the house, the shuttle bus will bring you back across the street to the museum. Don’t miss Elvis’ collection of cars and other vehicles, including a snowmobile of all things. 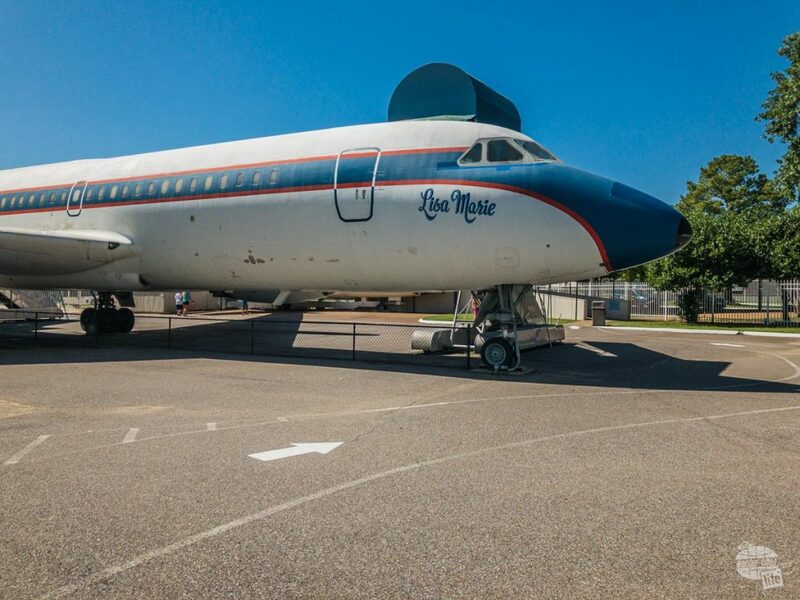 You can also (for an additional cost) see Elvis’s planes, which are opulent themselves. The larger of the two planes even has a bed in the back with a “chest belt” so Elvis could sleep on the way to shows. In all, seeing Graceland was truly an exceptional experience. One of the more unique (and free) attractions in Memphis is the Big River Crossing. 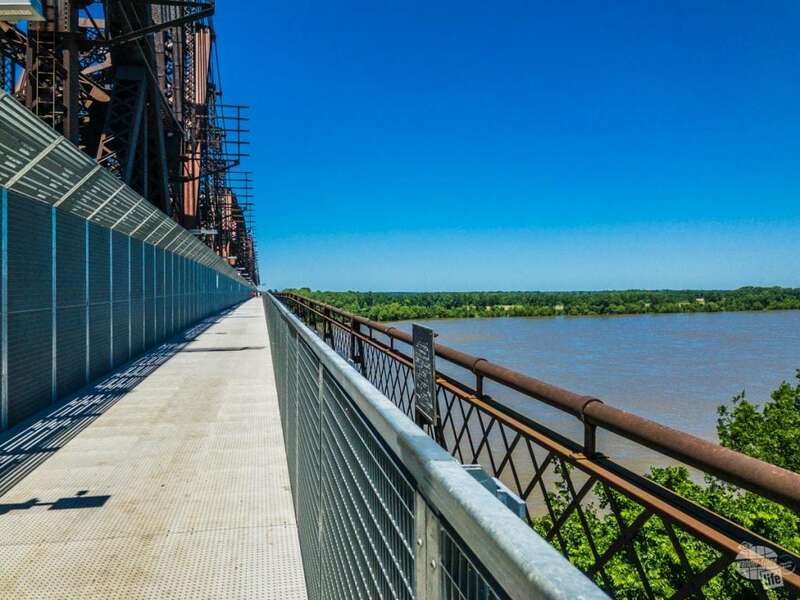 A converted wagon lane of the Harahan Bridge, the Big River Crossing is now a pedestrian bridge spanning the Mississippi River from Memphis to Arkansas. The bridge provides a wonderful (from my perspective) or harrowing (from Bonnie’s perspective) chance to walk across the river which serves as the heart of this country. 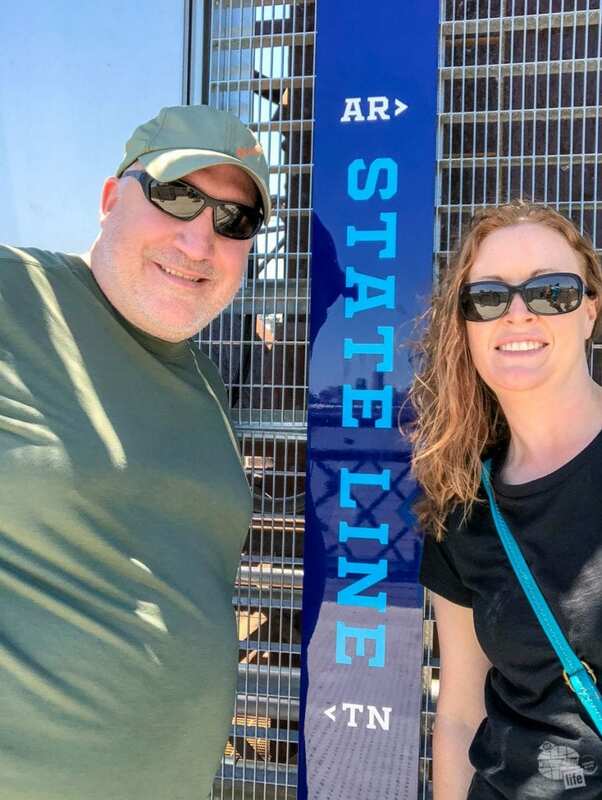 About a mile each way, the walk also offers the chance to stand in both Arkansas and Tennessee at the same time and provides great views of Memphis. Bonnie, who is terrified of bridges, managed to cross it without having a panic attack, but she gripped my hand pretty tightly the entire way across and would not go near the fence overlooking the river. The obligatory picture of the two of us on either side of the state line. That said, she was relieved the bridge did not have vibration from passing cars and when the train passed by, it did not shake the bridge at all. It was well worth the time and provides a unique way to get in some exercise. 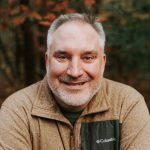 If you want to really work off all the amazing food you have been eating, there are walking trails in a park along the river on the other side in Arkansas. Even if you are not staying at the Peabody Hotel, you should go see the lobby of the hotel and the famous Duck March. The lobby and bar are one of the best places to relax and have a drink around. If you are there in the middle of the day, check the fountain for the famous Peabody Ducks. Originally a prank, the ducks permeate everything, even the cooking at the hotel’s French restaurant, which won’t serve duck. 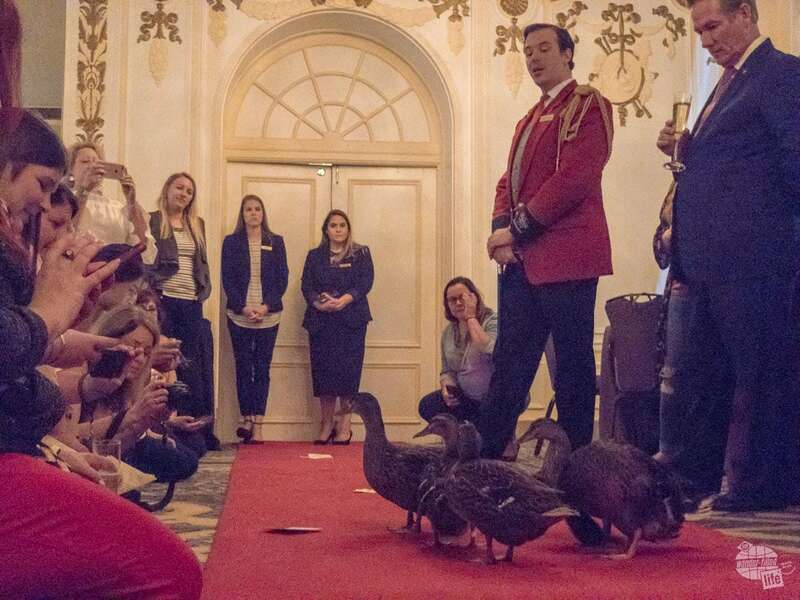 The Peabody treated our conference to a private duck march. Every day at 11 a.m. the Duck Master, with expert showmanship, leads the ducks from their condo on the roof of the building down to the fountain, via the elevator. At 5 p.m., he leads them back up to the roof. It was one of the coolest things I have ever seen. Yes, this is done without a cage or any type of leash. Maybe it was Southern summer nights. 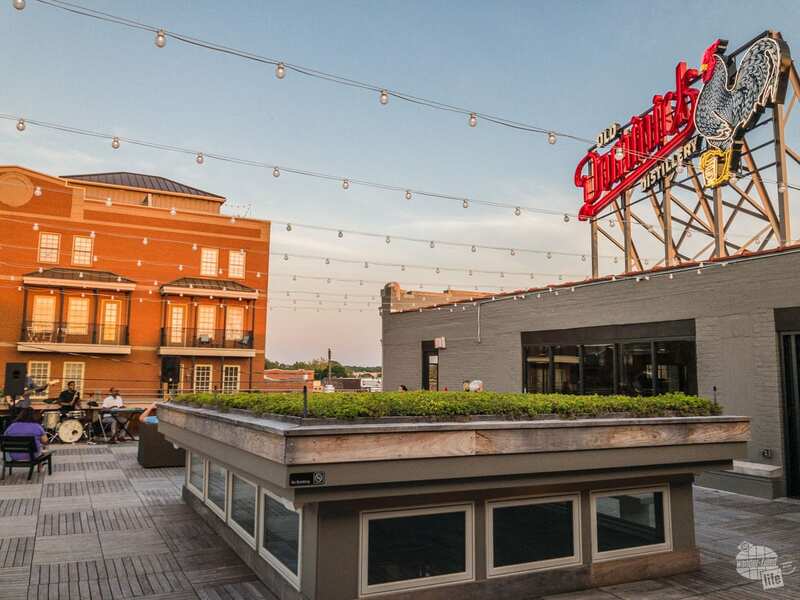 If you are in Memphis on a Thursday night during the warmer months, be sure to head up to the roof for another spectacle: the Peabody’s Rooftop Party. 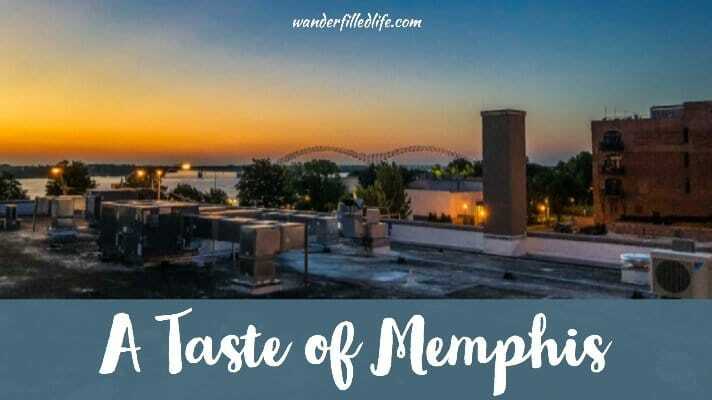 Starting at 6 p.m., the party has live music, tasty drinks and the best view of a sunset in Memphis. There are plenty of great hotels in downtown Memphis at various price ranges. Normally, we are Hilton folks and have stayed at the Doubletree Memphis in the past while headed home on a road trip. We really liked the hotel and would certainly stay there again. This time, however, as part of the conference we attended, we stayed at The Peabody. Wow, what a fabulous hotel! The rooms were spacious and comfortable. The hotel paid attention to a lot of little details. The breakfast buffet at Capriccio Grill was a Southern delight. 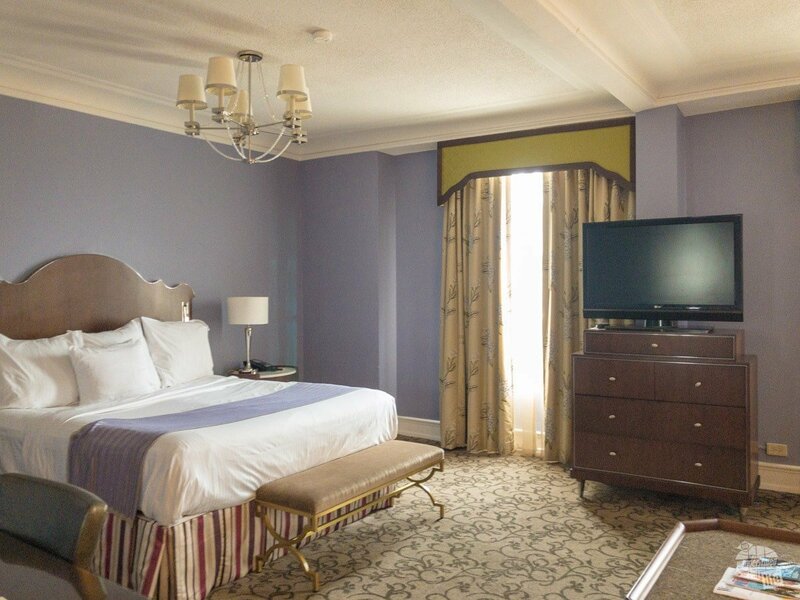 The Peabody is currently being renovated, but even older rooms are still gorgeous. The Peabody also did a good job taking care of us as a conference and were attentive to our needs. We would certainly stay here again and would recommend this hotel as either a luxury splurge or a great spot for a conference. 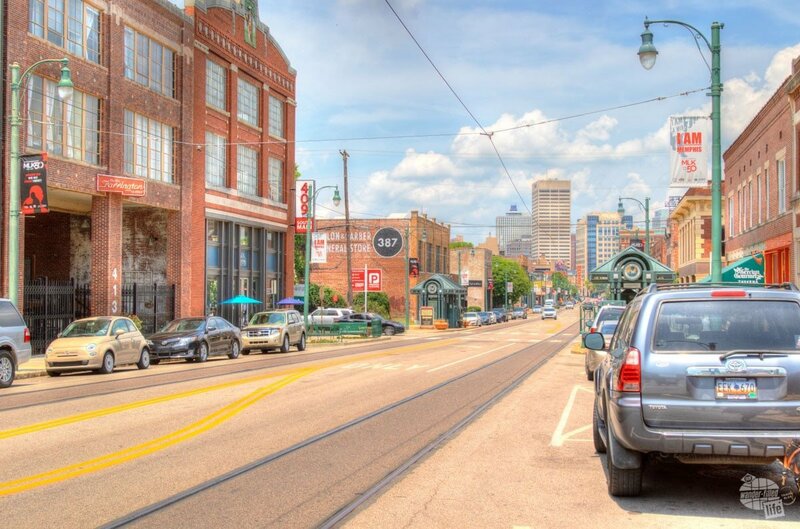 It is an easy walk to Beale Street and plenty of other amazing attractions in Memphis. 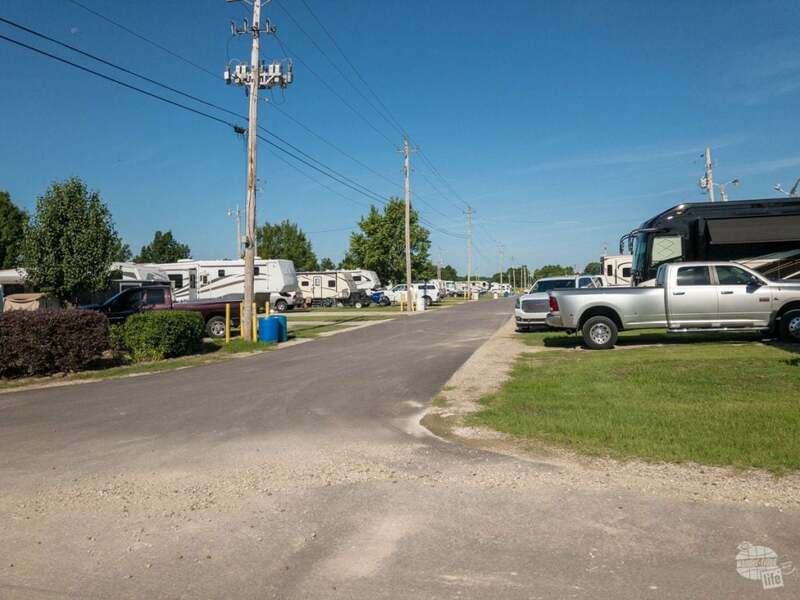 If you are camping, we found the RV park at the Agricenter to be a good spot to explore Memphis. The sites are all level (except ours!) and the park is convenient to several restaurants and shops nearby. Additionally, the center itself is pretty cool and we went in to check out the farmer’s market before we left. The Agricenter RV Park is a good base for exploring Memphis if you are staying in a camper, but there is not much in the way of shade. Simply put, we have to go back. What we had in Memphis was just a tease and what a tease it was. 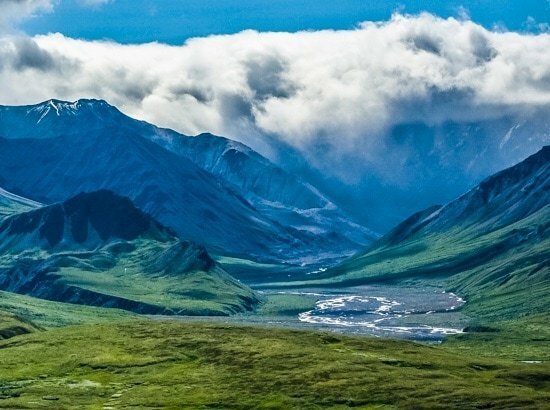 There is so much more we want to go back to see, taste and experience. It is rare Bonnie and I leave a city and say we would live there. We would live in Memphis. In the mean time, please check out the coverage of Memphis from some of the other conference attendees: No Back Home, Betsi’s World, The Petite Adventurer, Flight of the Educator, Chasing Departures, Raulerson Girls Travel, Myles to Travel, Campfires & Concierges, LL World Tour, A Dangerous Business, For Two, Please, Part-Time Traveler, Wolters World, Walking on Travels, Gen X Traveler, Eat Work Travel and Ryan Erwin. A huge thank you to Loflin Yard, Railgarten, Central BBQ, Gus’s Fried Chicken, Old Dominick Distillery, the Agricenter RV Park and Graceland for their hospitality while we were in Memphis. A special thank you to The Peabody Hotel, Memphis Tourism and Mediavine for partially sponsoring the Bloghouse Memphis conference. As always, all opinions expressed are our own. Wow! What a fun looking place. I’d be extra excited about the food. I’ll have to save this for when we visit so I’ll know all of the good places to eat. Thanks! There is so much food to love in Memphis. We can’t wait to go back for more!